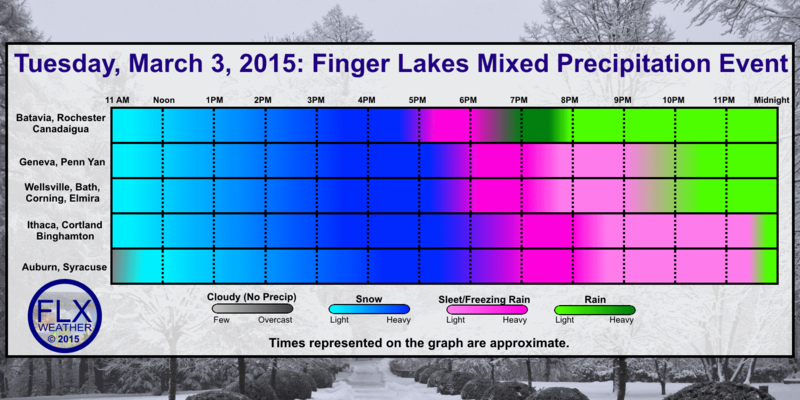 Mixed precipitation will impact the Finger Lakes today, with a variety of different precipitation types at any given time across the region. Precipitation will start as snow, some heavy, before transitioning over to ice and eventually scattered rain showers. This chart is designed to show what precipitation types and intensities can be expected around the Finger Lakes throughout Tuesday afternoon and evening. To use the chart, first identify the row that most applies to your location. Keep in mind that the weather does not fit into tidy boxes, so if you are not sure which row to look at, consider looking at the two or three that may best fit your location. Time advances from left to right along the chart, starting at 11am and ending at midnight tonight. The darker the colors shown, the heavier the precipitation can be expected. Generally speaking, snow will move into the Finger Lakes around midday, starting off fairly light. Snow intensity will gradually increase so that moderate to heavy snow is falling by the late afternoon. Snow accumulations by 6pm will generally by 2-5″. Starting in western New York and gradually spreading east, enough warm air will move in aloft to change the precipitation to sleet and freezing rain. Temperatures at the surface will also rise above freezing eventually. While this transition will be quickest for western New York and areas near Lake Ontario, much of the Finger Lakes and Southern Tier will see a slow transition with wintry precipitation lasting late into the evening. Icing amounts will not be huge, but travel will be sloppy and slippery tonight, so please be careful if you must travel. Precipitation intensity will taper off after 7 or 8pm as the bulk of the storm moves east. After these times, the precipitation will be much more scattered and spotty. Temperatures will continue to warm overnight, with spotty rain showers on Wednesday. Please vote for FLX Weather in the FedEx Small Business Grant Contest if you found this post, or any of the information on this website useful! Thank you!